Welcome to New York City. A place where stories lurk around every corner and linger in the hearts of the millions in these five boroughs. 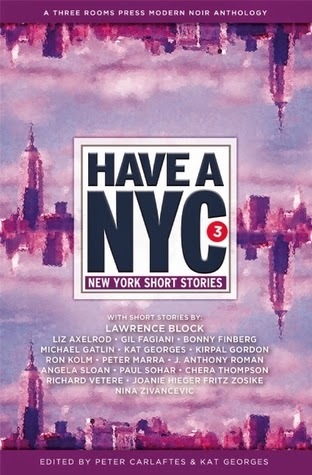 In these pages, tales of the underbelly of ­modern-day New York City hook-up with hilarious and ­poignant stories of love and loss in this annual collection of thrilling short stories by seasoned and fresh writers who know how to tell them. Edited by Peter Carlaftes and Kat Georges, these stories are sharp and concise, each an unusual take on the swirling panorama of the streets of New York, from Hell’s Kitchen to Greenwich Village and Coney Island to Williamsburg, Queens, and beyond. Readers are transported by a modern noir sensibility, populated by a plethora of characters of our times, carving new notches of experience on the city that still fires up the imagination. Authors in this edition include acclaimed crime novelist Lawrence Block (A Walk Among the Tombstones, 8 Million Ways to Die), Liz Axelrod, Gil Fagiani, Bonny Finberg, Michael Gatlin, Kat Georges, Kirpal Gordon, Ron Kolm, Peter Marra, J. Anthony Roman, Angela Sloan, Paul Sohar, Joanie Hieger Fritz Zosike and Nina Zivancevic. I am truly a fan of short story compilations. Always have been, probably always will be. I enjoy the different perspectives and voices that are obviously apparent but this collection was not one of my favorites. NYC is one of my favorite places in the world and I thought that the stories would be much more central to the theme of the city but a lot (or even most) of them were not really ones that had any particular characteristic that made me identify them with the city at all. The story that I did really enjoy the most was Out With The Trash which was a hilarious tale of garden gnomes living in NYC. The Cleaning Lady was a sad commentary on life in the city and was somewhat heartbreaking. I also particularly liked Missing Daughter as it was a realistic portrayal of family dynamics. Unfortunately only a few of the stories really thrilled me in the way I had hoped so sadly I couldn't give the collection a better rating but if you do go into it with somewhat different expectations, I think someone else could be pleasantly surprised. Thank you to Three Room Press for our review copy. All opinions are our own.